The NEC requires that Ground-Fault Circuit Interrupters (GFCIs) be installed in many different rooms and locations in both public and private buildings. They are now required in bathrooms, kitchens, appliance rooms or spaces, and garages. In addition, they are required in basements, near swimming pools, hot tubs, or fountains, and in outdoor receptacles. While these requirements are most commonly met with GFCI dual receptacles, they can also be met with GFCI branch circuit breakers. GFCI circuit breakers and receptacles protect persons from ground faults. These are typically caused by “hot” conductors with inadequate insulation coming in contact with an ungrounded metal object such as an appliance cabinet. If the metal surface is not electrically grounded, a ground faultwill be created. Any person touching that metal object while standing on a conducting surface (for example, a wet floor) could get a fatal electrical shock because his or her body has effectively become the grounding conductor. The current required to trip a standard circuit breaker is many times greater than the amount needed to inflict a fatal shock. It was clear that smaller, less expensive, and more sensitive GFCI circuits were needed because early GFCI circuits were clumsy and expensive. However, later versions that included solid-state electronics were small and could be mass-produced cheaply. To comply with UL Standard 943, Class A, a GFCI must trip in the presence of a ground fault as small as 5 mA (±1 mA) within about 25 ms. The NEC requires that GFCI protection be available in the locations previously listed. This can be accomplished by installing approved GFCI receptacles at those locations. Alternatively, GFCI circuit breakers in the load center can protect downstream standard receptacles in branch circuits serving locations where GFCI protection is required. GFCI circuits are now included in GFCI receptacles and miniature circuit breakers (MCBs). The Square D by Schneider Electric QO Qwik-Gard 20 Amp Two-Pole GFCI Circuit Breaker is intended for protection of entire branch circuits where dAmp-location shock hazards may exist, providing overload and short-circuit protection of your electrical system. GFCI circuit breakers have the same outline dimensions and are installed in the load-centers in the same way as standard units. The only visible difference is that they have two built-in leads. Available in ratings from 15 to 60 A, the 15- and 20-A units are the most popular. Their amperage ratings must match the amperage ratings of the wire gauge of the branch being protected. One of the two leads of the GFCI circuit breaker is connected to the load neutral and the other, identifiable by its black-and-white stripe, is connected to the neutral bus to establish a zero reference. 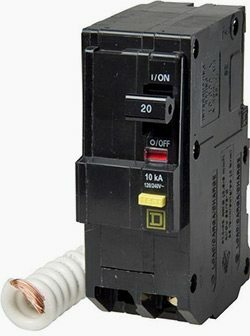 The disadvantage of GFCI circuit breakers is that after a ground fault has been detected, a GFCI circuit breaker will disable the entire branch circuit. The branch circuit will remain inoperative until someone finds and corrects the fault and then goes to the loadcenter to reset the circuit breaker manually. This can be awkward and time-consuming. By contrast, under the same circumstances a GFCI receptacle will disable only itself and any standard receptacles downstream of it, but not the entire branch circuit. After correcting the fault, the protected receptacles can be reactivated manually simply by pushing the reset button on the face of the GFCI receptacle. Consequently, if used outdoors they must be protected by gasketed metal or plastic weatherproof enclosures. An advantage of GFCI circuit breakers is that they can protect outside receptacles without the need for weather protection. I having something back in my mind, our Project is having Single phase Power outlets to be installed at Bath room and swimming Pool at 230 V, Is this required to be GFCI type. since, NEC required it, only for 125-V, single-phase, 15- and 20-A receptacles (Correct me if i’m wrong with my understanding). Thanks and Best regards to the Admin for the continual knowledge enrichment for us practicing electrical engineering. Nice Article.It would be much better if you can explain the functioning of the device by means of a proper electrical power plan diagram which can give a fundamental knowhow of the equipment.Thanks for this post. Hello Edvard. The article is very informative. 1)The GFCI will function if the grounding is properly done. Because when there is a leakage and the fault current or leakage current flows to earth,only then the GFCI will operate. 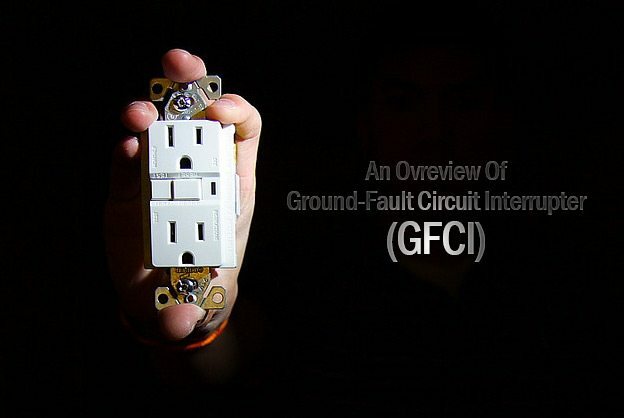 If grounding is not proper,the fault current will not flow to the ground and the GFCI will not operate. 2) Second thing, it is to be ensured during wiring,that there are no mix up in Neutral and body ground wiring,if there is a mix up, the GFCI will give a nuisance tripping, causing disruption in services..